Browse: Home » What were they thinking? This weekend, in preparation for Italy, I rode my bike 200 kilometres. Mostly on quiet, rural roads, where I found the drivers (with only one rude exception) courteous and patient, giving me oodles of room when they passed. Once I crossed back into the city limits, however, it was quite a different story. I was repeatedly buzzed, cut-off and generally disregarded, to the point I stared to wonder if my childhood dream of invisibility had finally come true. When I did make it home alive (by no small miracle), a quick check in the mirror told me that was not the case. So it left me wondering what was going through the minds all of these nameless strangers who had, to varying degree, recklessly endangered someone’s life, then carried on their merry way. Unfortunately, I can no more read minds than I can turn invisible, so I thought I would take a crack at guessing what they were thinking. Here goes. Who: The guy on a bike who ran a busy three way stop and almost smashed into me when it was my turn to proceed through the intersection. Who: The people responsible for the ridiculous and dangerous new “bike lanes” on Pembina Highway, that include bus shelters who’s doors open right onto the path of the bikes. Bill: “Haha! Of course! But unlike car/bike collisions, when bikes collide with pedestrians, MPI isn’t responsible, so it doesn’t cost the government any money! Who: The car full of guys who thought it was SUPER FUNNY when I almost smashed into the side of their car as they cut me off to get to Tony Romas. Who: The driver of the truck who buzzed me, even though there were three empty lanes beside him. Who: The woman who turned left in an intersection and almost smoked an elderly lady on a beach cruiser so she wouldn’t to have to wait 3 seconds for the next break in traffic. Hurried Woman: “I sure would like to be home watching TV instead of in this car. I could be missing something really important! Stupid Sunday traffic! Oh good, here’s a break in traffic. Drat! There’s an old woman on a bike. She’s not going fast enough!! Hmmm. She can’t weigh anymore than about 120 pounds, so she probably won’t even leave a dent – I’m going for it! Oy. I should (and will) mention that all of the above encounters occurred in a time span of approximately 25 minutes on a Sunday, about 5:30pm. Even if you can’t read minds either, you probably know what I’m thinking. It was a scary, frustrating, and stressful ride that left me both furious and sickened by a handful of my fellow Winnipeggers, not to mention the state of affairs in general. I try to stick up for Winnipeg drivers and cyclists whenever I can – after all, for every bad encounter, I have many, many encounters that are without incident, and might even be described as pleasant. I like to think that while we have a long way to go to becoming a bike-friendly city, Winnipeg is making great strides in improving infrastructure – or at least trying to look like we are. But a ride like this underscores the mountain of work ahead, and the risks that exists for people who choose to ride their bikes in this city. The reality is that, in terms of “bike cities”, this is the wild west, and it behooves every one of us, whether on a bike, in a car, or on our own two feet, to watch out for ourselves. And maybe – just maybe – watch out for each other too. I have daily encounters without riding on Pembina. Usually involves drivers along North and South Drive who avoid Pembina but only use stop signs as a ‘maybe I’ll yield’ signs. Yes, we all need to ride/drive with our eyes open and scanning the road, not a text. You are not alone. thanks for the pedestal. I certainly agree that it is terrible. Is it less terrible than dealing with the drivers/traffic on Pembina though? During rush hour, yes, otherwise probably not. I’ve actually talked with Mark I believe it was from Bike Winnipeg (their executive director) about it, and he said it was the best compromise they could get. I still think it’s horribly unsafe, but at least I’m less likely to be killed by a car while using it. I think it says a lot about how far our city has to go yet when that’s the highest praise I can give a piece of cycling infrastructure. I’m really not sure why anyone uses that bike lane at all when there is a perfectly good and much more fun piece of single track that runs along the river or on top of the dyke and runs parallel to the whole friggen thing AND is doable on a road bike (I’ve done it) AND helps you avoid that whole nasty BishopGrandinoverpassUniversityCrescent mess that it is. No need to ride on Pembina Hwy ever. Having said that some old woman looked me right in the eye this morning and turned into the Gas Station Parking at McGillavry and the Perimter lot beginning her right turn as she was beside me on the road. It’s like I wasn’t even there. And for her, I probably wasn’t. 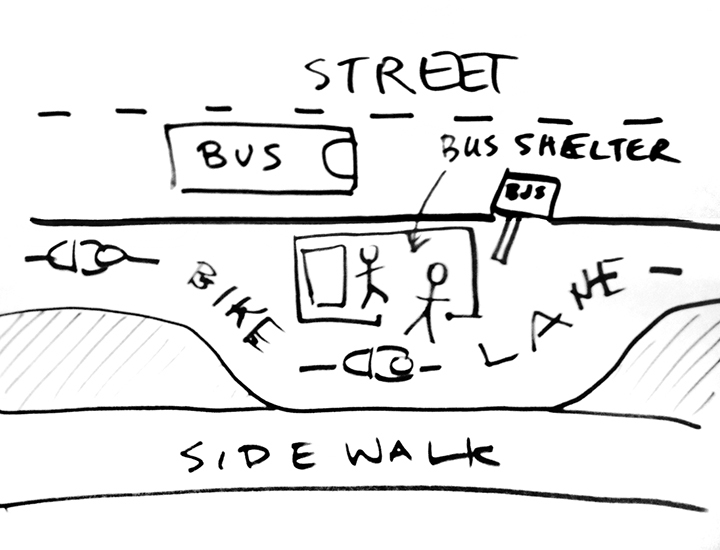 When I saw the original drawings for the pembina bike lane before it was built it looked like the bus shelters would be on an island, ie the bike lane would stay at street level and not go up to sidewalk level around the bus shelters. That would have probably made people standing around that they should watch out when they are in that area. At the end of the day. I honestly believe all those incidents wouldn’t occur if ……..and this is big. We all respected each other ! Andrea! Great post, as always. Unfortunate that the incidents that inspired it had to happened. Commenter Phil deserves a beer! We need to stop this ‘cyclists vs. drivers vs. whomever else’ and be people respecting people. Regarding Pembina’s “separated” bike lanes, I’m glad I’m not the only one who thinks they are they most pathetic, unsafe pieces of cycling infrastructure this city has to offer (well, aside from painted stencils on narrow lanes). I feel so strongly about this, that I do not ride in them…DO NOT! I did once, just so that I could say that I did, and the experience was as expected. I’ve had the opportunity to ride in them 12-15 times…I never did. I stayed in the curb lane, just as I do everywhere else on Pembina. Yes, sometimes I get the WTF??? look (ignore it), twice I’ve been honked-at and told to get in the bike lane (ignore it). And once confronted at the next red light. I told the driver the same thing I’m about to tell you: I don’t have to ride in in! That’s right! Nowhere on the HTA or MPI’s driver’s handbook or anywhere else does it say that if a ‘bike lane’ (or whatever other cycling infrastructure) is present; a cyclist HAS to ride in it. Cyclists are entitled to all the road, any lane…they are recognized under the HTA as traffic. I think we should all have a camera on our bikes and start publishing them on youtube and see what happens. Probably nothing but if they get on the news, maybe the cops would do something. Oh wait I must wake up the cops only go after cyclist on the sidewalks not cars trying to take out cyclists. Selkirk actually has this already – a little bike path along the river going north to the bridge – it a by-law offence not to use that path, regardless of how ridiculous it is. Thanks for the refreshingly-rare enlightened comment. You’re entirely correct on the effects of Bill 32, but for now they don’t apply. True also that we can only speculate the outcome, until the final version of the HTA, with amendments can be read as a whole. The item in question: giving municipalities the authority to prohibit or restrict certain types of traffic (ie: bikes) from travelling along certain routes, or within certain lanes, would likely only apply to high traffic/high speed routes…Chief Peguis, Lagimodiere, Bishop Grandin, Route 90, etc. However, given the “high profile” of the Pembina bike lane, I could see the City choosing to exercise it’s authority along this route. If they do so, I’ll of course have no choice but to follow the law. Doing so, will have to be done patiently, cautiously, and with respect to the poor pedestrians that have been put in this situation by our City’s lack of insight/planning. Let me clarify “high profile” this way: no one honks at me and tells me to get in the bike lane when I ride East on Jubilee from Pembina to Cockburn. No one honks at me and tells me to get in the bike lane when I ride North on Dunkirk from St. Mary’s to Fermor. In both cases the bike lane (ie: sidewalk) is right there, 2 metres away from where I’m riding…just like on Pembina. Safety note to cyclists using the lane: use extreme caution exiting from behind the bus shelter (specially when a bus is stopped), major potential for a ‘right hook’ from vehicles entering the various parking lots/driveways. I think the bike lanes on pembina are an improvement over what was there before. I’ve seen many pedestrians just standing in the bike lanes seemingly not aware that it is a bike lane. I think the risk for cyclists and pedestrians can be minimized if the cyclist reAlizes that near the bus stops they need to slow WAY down if any people are present. Not ideal or fun for the cyclist, but if a pedestrian is hit and injured I’d think its the cyclist’s fault generally for going faster than conditions dictate – the cyclist should always be in control and be going slow enough when near pedestrians to stop or avoid a hit if the pedestrian is not fully aware of the bike lane or is just plain daydreaming. Sidewalks have always been a safe place for pedestrians to be without having to pay too much attention. these new lNes change things. I love cycling and commute by both car and bike. In this case though the cyclist needs to respect that their speed is the largest risk factor in a collision with. Pedestrian. Impact energy increases with the square of the speed. I ride some bike trails, but even when we do, how many of us or on the trail, off the trail because they meander in all sorts of directions we don’t nesessarily want to travel ? They happen to be going in the general direction of your intended route, not to worry, they will deviate before too long, no need to be patient. Best advise is to follow the rivers, at least there we only have dogs, and people to contend with, and I always give everyone else the right of way, and have very seldomly had any issues. Of course if you have someplace specifice to go, and It’s not along the river, take the car and run over as many cyclists as you can along the way. Re: Pembina Hwy bike lanes. Has anyone else encountered a cyclist going the wrong way down the bike lane? If so, what did you do? If not, think about what you might do or need to do! Heads up! Rick, I’ve encountered it a few times in the morning, almost all of them being the same guy. The first two times I dodged him and shouted something he barely heard. The third time, I blocked the lane with my bike and made him stop, then advised him that what he was doing was A) illegal, B) unsafe, C) utterly daft since there’s a perfectly good lane on the other side of the street, where he should be. I haven’t been riding at that same time much, but I haven’t encountered him at least doing the same thing since. Jeezus where did you learn to ride a bike, give it up already. Jeezus – who is that? Appreciate your posts, always entertaining. Hope you’re training for the big event works out. I take the bike lane along Pembina, from Chevier to Plaza Dr, on a (almost) daily basis. Yeah, the routing through the pedestrian bus stop area is a wacked idea. However, the lane is a huge improvement over the death defying ride that Pembina is/was without it. If you’re riding slow and attentively you won’t have problems. If you want to hammer, shoulder check and by-pass the bus stops, there’s worse burdens to bear when it comes to riding in the ‘Peg. After living outside the city for 24 years, I’m fairly impressed with what our city planners have done for cycling now that I’m back. It’s not great for serious road cyclists, but it never will be. The commuters and recreational cyclists will get the infrastructure development and they should. I think it should be a prerequisite that in addition to taking a driver’s test, you need to ride a bike across the city in rush hour traffic to obtain a driver’s license. Actually, add that to the prerequisite list of being Mayor as well.